In my experience, one of the toughest things about being a new employee in an office is learning the business buzzwords. Every office seems to have its own set of buzzwords, an accepted lexicon forged from the various professional histories of management. The phrases aren't usually too difficult to decipher, but it can be frustrating to encounter outdated (or flat-out corny) terminology and be expected to use it. To avoid this for your new employees, consider striking these business buzzwords and phrases from your daily office vocabulary. 1. I'll check my Rolodex. You most likely do not still own a Rolodex. If, by chance, you just got off the set of the movie Wall Street, give that old dusty thing to Michael Douglas and buy a computer. Telling someone you'll check your Rolodex is basically telling them you're out of touch, which is never a good thing. Let's not. Let's go to lunch together. Let's not make going to lunch together some chore to check off of a list. I can do lunch at my desk by myself. It's not nearly as fun as enjoying lunch with a colleague. Want to sound like an old corporate windbag? Start talking about Six Sigma! Minimize variability! Start telling me what you did to become a green belt in Six Sigma and you'll minimize the likelihood that I'll keep listening. No one is saying it can't be used effectively, but please, rather than taking it as gospel, use what is good about it in a way that acknowledges that your workforce is comprised of people, not statistics. 4. We're going to give it 110%. Really? You are? Why don't you give it 1,000%? Or, while we're making up things that can't happen, a quadrillion percent? Just say you're going to give it your best. Saying you're going to give it more than your best makes you sound disingenuous since, by the definition of the word "best," you can't. I'm not sure where this one started, but I hear it enough for it to make this list. What's my bandwidth? I don't know how to answer that. Wide? A lot? A little bandwidth? Ask me when I can get something done and I'll tell you, but ask me what my bandwidth is to accomplish something and I might just say "It's good" to see if even you know what you're asking. When I hear this, I assume you're running a 56k modem and I won't be able to get through on the phone if you're busy "surfing." I know it can be tough to keep up with tech jargon, so I'm going to make this one very simple. You don't surf the Web; you go online. In 10 years, it's possible no one will say "go online" and they'll make fun of me for saying it, but for now, no surfing. I get why people still use this, especially people who remember the pre-Internet age. We still use www., so why wouldn't we use World Wide Web? The short answer is that I don't know. We just don't. It's the Internet. That's it. It might be splitting hairs, but to me, Tim Berners-Lee invented the World Wide Web. People invented the Internet. 8. Throw it to the blogosphere. I heard this one just the other day, and it's been bugging me ever since. I think the last time anyone legitimately threw anything to the blogosphere, it was in the hopes of someone mentioning it on LiveJournal. Maybe they mentioned it on their MySpace page while waiting three hours for their favorite Green Day album to download over LimeWire. Anyway, you get the idea. Today, blogging can be lumped in with social media to an extent, but regardless, the blogosphere is an outdated concept. Whenever I want to make fun of useless buzzwords, I throw out the trusty old "synergy." My general rule on whether or not a corporate phrase is viable is if I've ever heard it outside of an office. In the case of synergy, I haven't. We don't say sports teams or restaurant kitchens are synergistic, so why are we saying it about the office? Not only is it a little silly, but it over-simplifies a complex topic. When someone tells me we have to operate with more synergy, they're not actually telling me anything. What do we need? Better communication? A better office environment? Do we need to rearrange the furniture? Hire a consultant? Use your words, but keep synergy out of it. 10. We need this to go viral. First of all, every business wants every viable piece of content they produce to go viral. When something goes viral, people spend a lot of time and money trying to figure out what happened, and few of them do. If I run a garage and I produce a piece on "Five Things to Do to Avoid the Mechanic," I'm going to want that to go viral. Ninety-nine times out of 100, it won't. It's the nature of viral content. Just create the best stuff you can and promote it in the best way you can. Also, "viral" means different things to different people. Just say you want your content in front of as many eyes as possible, or set goals, but don't dumb it down to "viral." I'm going to make this one short and sweet. Everything you do is something you did "going forward." Even if you fix something you did in the past, you did it to benefit what you're doing going forward. 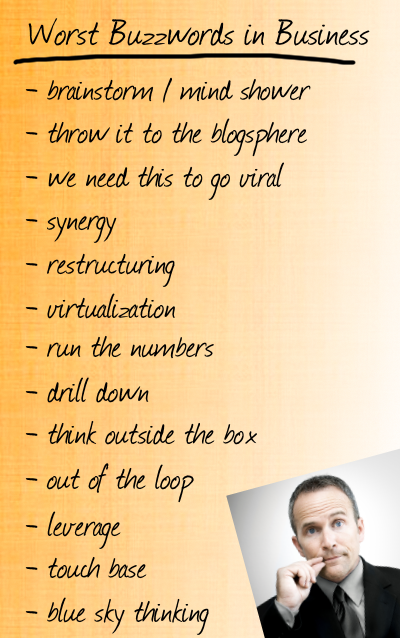 The 11 Worst Buzzwords in Business and Why You Should Avoid Them - InLoox • Copyright 1999-2019 © InLoox, Inc. All rights reserved.